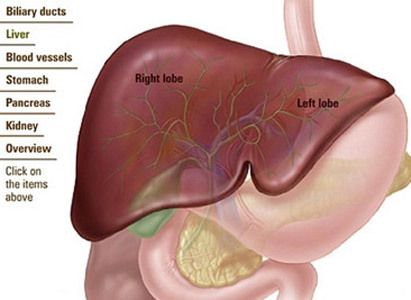 Bile duct carcinoma originates from extrahepatic bile duct and includes malignant tumor located from hepatic hilar region to the lower end of common bile duct. The incidence rate of bile duct cancer have increase trend in recent years, and even in some high risky area, the incidence rate has doubled. The malignancy of bile duct cancer is very high, and its main symptoms are jaundice, abdominal pain, itch of skin and other related symptoms. 1. Jaundice: as bile duct cancer patients have no obvious typical symptoms and most of them won’t go to hospital until jaundice appears; jaundice is the earliest and most important symptom of bile duct cancer, and it is said that 90-98% bile duct cancer patients have different degree of yellow dye to skin and sclera. Jaundice would get worse gradually without pain for most of the cases; in a few cases, jaundice manifests as undulant; jaundice for upper bile duct cancer would appear earlier than that of middle or lower bile duct cancer as there are buffering function of gall bladder. 2. Abdominal pain: nearly half of patients would suffer from abdominal distention or discomforts, weight loss, poor appetite, etc. These symptoms are usually regarded as early warning symptoms of bile duct cancer. According to clinical observation, 3 months later, bile duct patients would suffer from abdominal pain. 3. Itch of skin: itch may be caused after or prior to the occurrence of jaundice and is due to the increase of bilirubin content in blood and this stimulates the peripheral nerve of skin so that cause itches to skin. Sometimes there are some other accompanying symptoms like overspeed heartbeat, bleeding tendency, listlessness, acratia, abdominal distention, etc. 4. Other symptoms: besides the above mentioned symptoms, there are some other symptoms like nausea and vomiting, weight loss, deep yellow urine like soy sauce or strong tea, light yellow stool shaped like pot clay and so on; tumor may collapse in late stage, then bile duct bleeding shall be found and concealed blood test of stool or black stool is positive; this may even cause severe symptom like anaemia; patients with hepatic metastasis may suffer from liver enlargement, liver cirrhosis and so on.